The Siege of Brookfield was a battle between Nipmuc Indians under Muttawmp, and the English of the Massachusetts Bay Colony under the command of Thomas Wheeler and Cpt. Edward Hutchinson, in August 1675 during King Phillip’s War The battle consisted of an initial ambush, called Wheeler’s Surprise by the Nipmucs on Wheeler’s unsuspecting party, followed by an attack on Brookfield, Mass. and the consequent besieging of the remains of the colonial force. 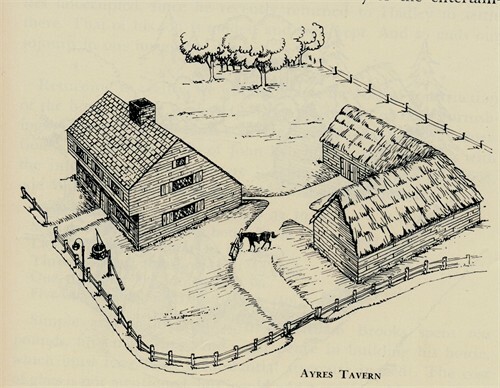 The siege part of the battle took place at John Ayers‘ Tavern/Garrison in West Brookfield, John was the brother of our ancestor Sarah Ayers LAMSON. The identify of their parents is not known. John Ayers was killed in the initial ambush, the location of which was a subject of extensive controversy among historians in the late nineteenth century. John Ayres removed to Brookfield, Mass, when the settlement of that place was commenced, and in Nov. 1672, sold all his rights at Ipswich, including those “belonging to my father-in-law Mark SYMONDS, and used by me while I was a tenant upon Mr. John Norton’s farm.” See John Ayres’ bio at the end of this post for details of his years in Brookfield. Simultaneous to the outbreak of war the colonists sent Ephraim Curtis to the west of Boston into Nipmuc territory to negotiate with the tribe and obtain assurances of loyalty to the English from them. However, Curtis’ expedition party found only empty Nipmuc villages which signified that something was already afoot. Eventually, Curtis managed to find the whereabouts of the Nipmuc chief sachem, Muttawmp, and agreed to a meeting at a pre-arranged spot. However, unbeknownst to Curtis it was too late for negotiations, as the Nipmucs, under sachem Matoonas, had already attacked an English settlement at Mendon and had decided to join Metacom’s rebellion. Curtis was later joined by Captain Thomas Wheeler and Captain Edward Hutchinson (son of Anne Hutchinson). It was assumed that they did not want to join the confederacy for the destruction of the English. At least four of these Rulers; Black James of Chabonokongkomun, Keehood of Wabaquasset, John of Pakachooge and Conkganasco of Quaboag were found among the enemy at Menameset, the middle of July. Curtis and his men met with the Nipmuc sachem Muttawmp on July 14, the same day that another party of Nipmuc warriors was attacking Mendon. Hence, at the meeting, Muttawmp already considered himself to be at war with the English. However, while Muttawmp’s soldiers were rude to the English emissaries, the sachem himself considered it better to feign friendship to the colonists and so told Curtis that he would show himself in Boston within seven days. After Curtis returned to Boston and informed his superiors of the arrangement, a decision was made not to wait for Muttawmp’s arrival, but instead to sent Captain Hutchinson, along with Captain Wheeler and 30 mounted soldiers, as well as some “Natick” Praying Indian guides to negotiate with the Nipmuc sachem directly he party made their way to New Norwich where, on July 31, they found the village empty. Consequently they learned that the Nipmucs had moved their base camp to about 10 miles from Brookfield, and sent Curtis and the Naticks to talk to Muttawmp again. There, the emissaries were once again treated rudely by the Nipmuc braves, while Muttawmp continued his deception and agreed to meet Hutchinson in Brookfield on the following day. However, when the colonists arrived in full force at the agreed spot the next day they found nothing. At that point the Natick guides tried to persuade the English to give up and return to Brookfield. Hutchinson and Wheeler, however, decided to march on to the Nipmuc camp, where they had met them the previous day. In order to reach Muttawmp’s camp, the English had to cross a swamp, taking a narrow path in single file. Despite more protestations from the Indian guides, Hutchinson and Wheeler decided to risk it, while at the same time aware that they might be walking into a trap. In fact, after they proceeded for about 400 yards, Muttawmp’s braves emerged from among the tall swamp grass and attacked them with bows and rifles. When the English turned around and tried to flee along the narrow path, they encountered another group of Nipmucs blocking their retreat. The colonial force was so completely disorganized that initially they were not even capable of returning fire. Both Hutchinson and Wheeler were seriously wounded. Eight other men were killed in the initial attack and several others were wounded. 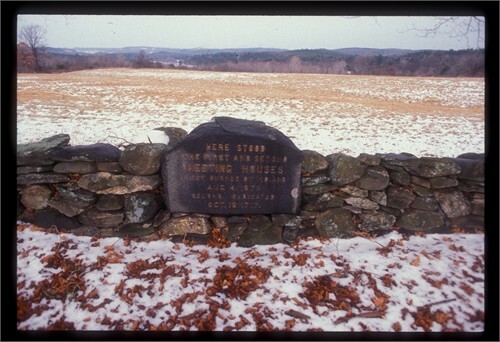 The entire force would have most likely been annihilated there and then had it not been for the Natick guides, one of whom assumed command of the company in place of the wounded English captains, and managed to lead the rest of the English out of the trap and into the hills near the swamp. Once out of immediate danger, the group made its way to Brookfield, fully aware that Muttawmp was in pursuit. 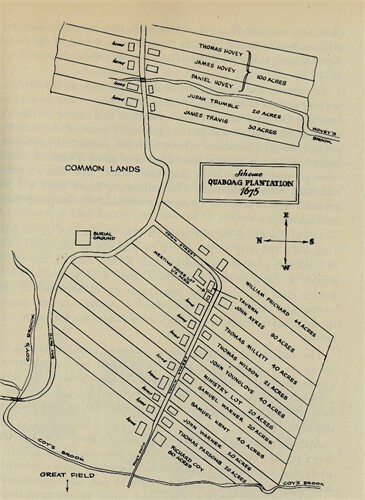 Wheeler and the rest of his men, led by the Natick guides, fled to the English settlement of Quabaug (which later was to become the town of West Brookfield). The village was relatively isolated which meant that no help was coming soon, even if the colonists in other New England towns got word of the attack. At Brookfield, the soldiers gathered at the house of Sgt. John Ayers (who had been killed in the ambush) and there they were joined by about 70 villagers who had learned of the coming Nipmuc attack. Ayers’ garrison was the largest building in the settlement. Once inside the house, Wheeler recovered from shock and took charge of his men again, and ordered them to fortify the defenses. He tried to sent two soldiers to get help, but they did not leave before the arrival of Muttawmp and his warriors. In all about 80 persons had gathered inside the Ayers house. When they arrived at the scene, some of the Nipmucs kept the garrisoned house under constant fire, while others drove off the livestock, looted other houses in the settlement, and then set them on fire. Once Muttawmp had gathered all his men and completely surrounded the house he launched three attacks on the Ayers house. All three were unsuccessful and the only English casualties that occurred on the first day were two colonists who made the mistake of stepping outside and who were quickly killed. As a result Muttawmp realized that he needed a different approach. On the second day of the siege, early at dawn, Muttawmp had his men fill a village wagon with combustible material and direct it at the fortified house, hoping to set it on fire and in that way force the defenders out. However, the plan did not work because of heavy rains which began to pour while the wagon was in preparation. During the confusion that accompanied the execution of the plan, Ephraim Curtis managed to sneak out of the house and made a successful run for the woods. He eventually made it to Marlborough although by that time colonial soldiers had already been alerted by some travelers who had heard gunfire near Brookfield. 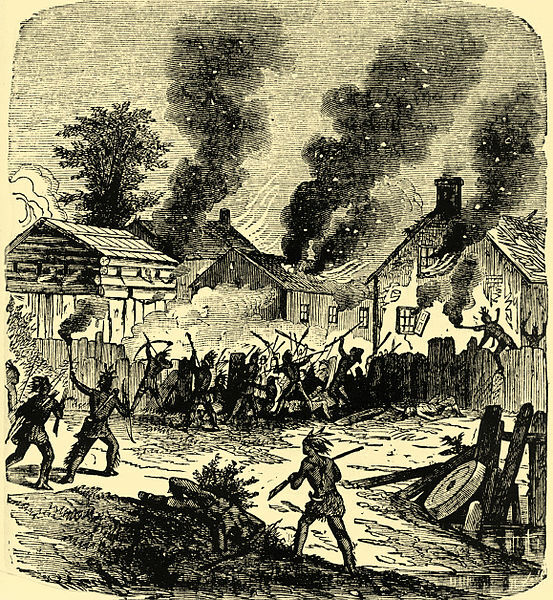 As a result, a group of men under Major Simon Willard were already on their way to relieve the besieged. Willard, who was the chief military officer of Middlesex County, Massachusetts, with 48 troops had been stationed at Lancaster. After being informed of the siege he hurried to Brookfield, arriving on the night of the 3rd. This forced the Indians to break off the siege. Further reinforcements continued to arrive, and Willard eventually commanded 350 English soldiers and an unknown number of Mohegan Indian allies. The battle between the two sides continued until the middle of the night of the 4th but neither side could dislodge the other. At that point, Muttawmp, who felt he had already achieved most of what he wanted (including obtaining crucial supplies from the looting of Brookfield), decided that he did not want to risk the death of any more of his warriors and withdrew from the battlefield. The noise of the men arriving was great and the Indians quickly set fire to the meeting house and the only other house and barn, and bolted. As soon as others heard of the distress, soldiers from all quarters arrived. A company under Captain Watts from Hartford, a band under Lieutenant Cooper of Springfield, and others from county of Essex under Captains Lathrop and Beers, marched together as far as Meminimesset, but found no trace of Indians. A garrison was maintained until winter when the Court ordered the people to leave, not to return to Brookfield for twelve years. After withdrawing from Brookfield, Muttawmp led his men to a fort at Hatfield. Metacom himself, with 40 Wampanoag warriors, arrived there a short while later. King Philip, hearing of the attack, rewarded the Nipmuc sachems with unstrung wampum. Throughout the rest of the 1675, the Native American forces had a string of victories, thanks in large part to skillful leadership of sachems like Metacomet, Muttawmp and Matoonas, who exploited their knowledge of local terrain to achieve surprise and often successfully ambushed colonial forces sent to track them down, much in the same way as happened in Wheeler’s Surprise. However, 1675 ended with a significant defeat for the Native Americans, with the defeat of the Narragansetts in the Great Swamp Fight. While Philip and his allies managed to regain the initiative for some time in 1675, eventually the scorched earth tactics practiced by the English caused them to start running out of supplies. The supply shortage, coupled with a partial amnesty, prompted an increasing number of chiefs to leave Philip’s alliance. . In the spring of 1676 the tide turned in favor of the English. Muttawmp, the victor of Brookfield, tried to make peace with the English. Promises of safety were broken however, and he was executed in September 1676. John Warner, son of William WARNER and son-in-law of Mark SYMONDS removed from Ipswich to Brookfield in 1670, was one of three men there who took the Indian deed for the town of Brookfield, December 19, 1673, and was one of the principal inhabitants there. When the town was destroyed by the Indians in 1675 he retreated with his younger children to Hadley, Massachusetts, whither Mark Warner, an elder son, and other children had gone to settle. . Even the death of John Ayres was not to end the contribution of this man to the welfare of the community, since it was to be his house which was to provide a haven of relative safety and to be occupied and defended by the surviving inhabitants and soldiers through those three gruesome days in August 1675. After the Indian siege of Brookfield had been relieved by the arrival of Major Willard and his troop, the inhabitants left for scattered areas, looking for security and peace. Suzannah Ayres and her children returned to the familiar surroundings of Ipswich where still remained some of her kinship. She presented to the Court at Salem an inventory of the estate of her deceased husband amounting to £195 13s and 6p. In 1678, she is found as the owner of a house in Ipswich. Among those of the family listed as residents of Ipswich in 1678, in addition to Suzannah, we find John Jr., Joseph, Samuel Sr., Samuel Jr., and Thomas Ayres . 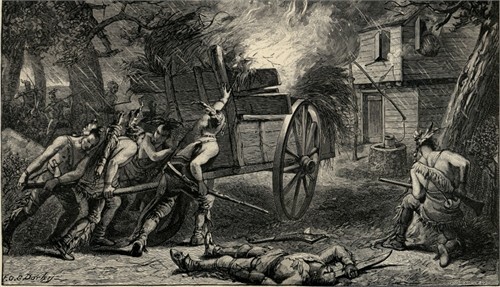 In 1682, a former resident of Massachusetts Bay Colony, named Samuel Hall, left a bequest of £100 to be distributed among the victims of the great fire in Boston and of the Indian wars in the Colony. Suzannah received 33s of this, but died soon after on Feb 2, 1682/83. In 1703, Samuel, John and Thomas were appointed executors of the estate of John Sr. On Jan 14, 1716, as recorded in Worcester in 1741, the land formerly possessed at Brookfield by John Ayres Sr., was conveyed to Joseph Ayres of Ipswich by Thomas, Mark, Edward, and Nathaniel, sons of Sgt. John; and by Samuel, son of Samuel and grandson of Sgt. John; and by Robert Day, son of Suzannah (Ayres) (Day) Waite and grandson of Sgt. John. The petition is dated Jun 17, 1717, but was read in the House of Representatives on Oct26, 1717: ‘A petition of Thomas Ayres, Joseph Ayres, Mark Ayres, Nathaniel Ayres and Edward Ayres sons and heirs of John Ayres heretofore of Quaboag, alias Brookfield, deceased in testate, showing that in or about the year 1660, the petition of father with others bought and purchased of the Indian natives tract of land of about eight miles square then known and called by the name of Quaboag, after which, viz in the year 1673, the General Court erected the said land into a township by the name of Brookfield, then in the year 1675 a war broke out with the Indians, who killed the petitioners’ father and several other inhabitants, and the rest being drawn off by order of the government, the whole town was left desolate, and all the houses burned down by the enemy, after which, about 1690, the said town of Brookfield was in a likely way to be settled. And in the year 1703, the petitioners having obtained an administration on their father’s estate lying in Brookfield aforesaid, petitioned the General Court that a committee might be appointed by make inquiry and cause a record to be made of the lots, rights, and proprieties of land within the said plantation belonging to the ancient settlers thereof, that so the petitioners might have and enjoy what belongs to them in the right of their father, which prayer of the petitioners was accordingly granted, and Samuel Partridge Esq., and others appointed a committee were ordered to make inquiry and cause a record to be made of the said lands, rights, and proprieties, but the said committee neglecting in that service, then petitioners renewed their petition to the General Court, who appointed a hearing thereon; however the petitioners withdrew their petition at the request of the said committee, and upon their promise that they would forthwith proceed to settle the petitioners in their rights which accordingly they did to the satisfaction of the petitioners, who were at the expense of £150 at least in obtaining the said settlement, but after all the committee did at last declare all their proceedings in the premises to be null and void under no other pretense, but that the said lands were not improved by the petitioners, and the very lots that the petitioners father died possessed of, and particularly his home lot which he defended against the Indians at the loss of his life, are granted by the said committee to other persons very unjustly and contrary to the order of the General Assembly, by all which the petitioners are kept out of the possession of father’s estate. Upon the whole the petitioners pray the honorable Court will confer upon them the lands which the said committee have laid out to them containing by estimation no more that 1,500-1,600 acres, although they have heard their father and many others say that he had 2,000 acres of land in Brookfield. Which lands so laid out by the said committee they shall rest satisfied and contended, unless the Court shall please to make them some further consideration: Read in the House of Representatives October 26, 1717 and ordered that the Committee of Brookfield be served with a copy of this and the petitioners former petition, and that they appear before this Court on the second Thursday of the next May session, to show reason why they declared the petitioners land to be forfeited. Sent up for concurrence. Read and concurred. Consented to: Samuel Shute’ . John’s wife Susannah Symonds was born 1617 in Essex, England. Her parents were Mark SYMONDS and Joanna [__?__]. Susannah died 2 Feb 1682 in Ipswich, Essex, Mass. John was of Ipswich in 1648, and was then a tenant of John Norton’s. His parents are not known, but it seems highly probable that he was accompanied there by two of his brothers-in-law, William Lamson and William Fellows. The first concrete fact we were able to associate with the family, is the appearance of the name of John Ayres in the early records of Ipswich. This appears in the year 1643, which indicates the approximate date of coming to Ipswich, but not necessarily exactly, since grants were frequently recorded sometime after they had been made. He was also listed as an inhabitant of Ipswich in 1648, and married Susanna, daughter of Mark SYMONDS of who’s (Mark Symonds) estate he was appointed administrator. In such capacity, on Nov 24, 1659, he sold a house and a three acre lot to another son-in-law of the deceased, Edward Chapman . He was allowed the privilege of commonage in Feb 1667, and admitted a commoner at Ipswich in March of the same year. Captain John, as he was known at Ipswich, came to Quaboag Plantation before May 1667. The time of his removal can be estimated fairly accurately from known facts. He was named one of a prudential committee for the new plantation in the Regrant of 1667. At the time of his removal, he has his full family, consisting of seven sons and one daughter, all of whom came with him to Quaboag. They were: John Jr., about 18; Samuel, about 17; Thomas, 15; Joseph, 12; Susanna, about 11; Edward, 9; Mark, 6; and, Nathaniel, under 3 years of age. This father and head of family certainly had need for provisions to maintain his large dependency, and it is not long after his arrival that he begins what is to be an extensive trade with John Pynchon, son of the founder of Springfield, William Pynchon. The first entries in the Account Book on July 14, 1668 are for bacon, corn, salt, and white meal – all household necessities. John Ayres was owner of much land within the Plantation. The amount which he paid John Pynchon for his original grant was “£5 12s 6p, or four and a half times the value of a single house lot with its usual allowance of meadow and planting ground. In addition to this, he leased a large meadow (Matchuk-19 acres) from John Pynchon from June 28, 1671, until the time of his death. Record of this appears in his account on: Jun 28, 1671; Nov 28, 1672; Oct 23, 1673; and, Aug 18, 1674. This large acquisition and usage of land indicates that he had grown sons, that he was relatively wealthy, and that he was capable of maintaining such an amount of this most precious commodity. He can certainly be classified as a substantial husbandman. Probably from the time of construction of his home and establishment of himself at Quaboag, he provided accommodations for travelers. Although his first actual license for maintaining a tavern was not granted until the Fall of 1671, the following entry leads us to believe that he offered food and shelter prior to that time. On Jun 28, 1671, the following: ‘By my expense at his house last summer and once this Spring 00 12 00’. That Ayres was a respected planter is confirmed by the following found in the Record of Hampshire County Court for Sep 26, 1671: ‘Goodman Ayres of Quabauge licensed to sell wine, etc.’ This permit was renewed on Sep 24, 1672: ‘Goodman Ely of Springfield hath his license continued for the year ensuing to keep ordinary and to sell wines and strong liquors, providing he keep good rule in his house. Also Goodman Ayres of Quaboag hath his license continued on the same terms’ . And for the last time on Sep 29, 1674: ‘John Aires of Brookfield hath his license renewed for the year ensuing’. As we know, this tavern was still in operation at the time of the Indian assault on August 2, 1675, and being the strongest building at the Plantation, was converted into a fortified house to provide protection during the siege which followed. In addition to his maintaining a large farm and keeping the tavern, John Ayres found it advantageous to devote much of his time to the mill of John Pynchon. He was associated with this most essential enterprise from the very beginning of the construction of the mill. The first link with the project comes in the following account of the Plantation with John Pynchon: ‘The Towne Dr. Aug. 1669 £2 steel G Aires had for Web more £4 Steel G. Aires had Nov. 8, 1669’. Also, on Nov 8, 1669, Goodman Ayres received delivery of nails and a ‘spindle in Rine’ for the mill. 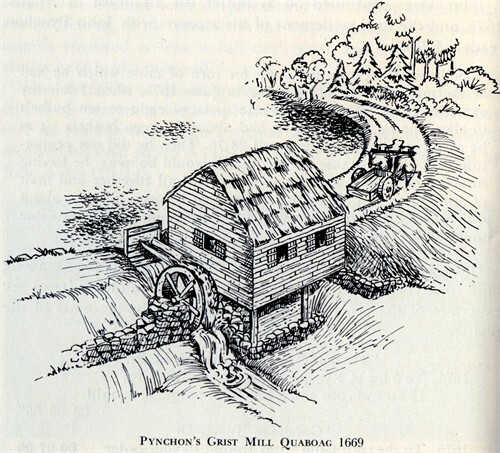 On Jun 28, 1671, he was paid £2 1s 8p for his part in building the mill house, and £12 14s 7p for other matters relating to the mill, by John Pynchon. The large amount of money involved certainly indicates that Ayres either sold a considerable piece of property or rendered valuable services to Mr. Pynchon in connection with the mill. In Nov 28, 1672, is recorded the beginning of a business arrangement with John Pynchon which was to last for the remainder of Ayres life: ‘Agreed with G. Aires, to keep my mill at Quabauge and tend it, to grind corn brought there, for one year, he to take the tole allowed, viz., one half peck out of a bushel, on all the corn that shall be ground by one and all; and for his tending the mill, he is to have one third of the tole, I am to have the rest for my part paid. He is to grind all the corn at the mill except Gdm. Pritchard’s corn. Gdm. Pritchard having liberty to grind his own corn only’. On Dec 18, 1673, this agreement was renewed ‘for the year coming or longer on the same terms as formerly’. The final determination of this contract is recorded as follows Aug 28, 1675: ‘Goodman Aires owes me more for corn of mine, which he had at the mill, as he told me being, in June 1675, when I left my expenses at his house on acot, he spoke of eight or ten bushels to allow me for, and what he had about 14 bushels 1/2 as he gave me an acot on April 28, 1675. That he did not proportion that wheat because he said it would be more, he having disposed of it, and would give me an acot of altogether; and malt of mine, he took it all, so that I acot he owes me near about £4, whereof I have received as per contra about £2 so rests due to me about £2. The account was settled by discount of £1 Li 7s 11p on Aug 28, 1675. This last was of course after the violent death of John Ayres at the hands of the Indians. John Ayres, farmer, taverner and miller, still had time and energy left to devote to civil affairs of the infant plantation. He was one of those appointed by the General Court in 1667 to the committee to oversee the affairs of Quaboag Plantation – a position of considerable responsibility. He continued in that capacity until the incorporation in 1673. His name appears on the ill-fated petition of Oct 9, 1670, requesting a grant of additional lands at Quaboag to provide an inducement for increased settlement. The Petition for Incorporation contains the names of John Sr., John Jr., and Samuel Ayres, indicating the importance of the family in the affairs of the community. John Sr. served as Constable for a period, as revealed by the following in the Magistrate Book on Nov 2, 1670: ‘James Hovey and Priscilla Warner of Quaboag joined in marriage. Constable John Aires attesting their legal publication’. In a controversial court case between John Younglove and the inhabitants of Quaboag Plantation on Jun 19, 1672, John Ayres and William Prichard represented the interests of the people in a losing battle with their unstable minister. However, in an other encounter with Mr. Younglove on Mar 31, 1674, he was more successful: ‘John Ayres, Sr., of Brookfield being complained of to this Court for that he refuses to pay certain arrearages of which he has been assessed toward Mr. Younglove his maintenance. Also, he brings the fact to make his defense sayeth: It was for that the arrearages for which he is now assessed for keeping the ordinary formerly: the Court doth acot that such arrearages ought to be paid by the people therein, in general some other way, and it is belaid on him for keeping the ordinary past: And as to the question, the Court they should like that Mr. Younglove may have his due. The Court decrees that the law doth – determine it. Therefore do accordingly order that which is to be yet due him his acot, for to the selectman there to assess the inhabitants there for it, in the way which they formerly paid by hand, levy the same by the Constable according to law’. On the same day, Mar 31, 1674, John Ayres along with Thomas Parsons were referred to by the Court as available consultants for the committee appointed to construct a bridge over Coy’s Brook, as a connecting link of the Hadley Path, then under construction . Here again we find our subject busy in the affairs of the community. The personal affairs of the family saw changes in the years 1672 and 1673. On Aug 28, 1672, John Ayres Jr., married Abigail Hovey, as recorded in the Magistrate Book. Soon after this, in Nov 1672, John Sr., sold all his lands and rights in Ipswich. On Nov 28, 1672, he purchased a lot at Quaboag for his son Samuel for a few shillings more than the customary price for a single house lot. The entry specifies that the lot contained 30 acres. On Dec 18, 1673, John Sr., and John Jr., ‘Tooke the Oath of Fidelity to This Government’. In addition to his other activities, Sergeant Ayres was commander of the small detachment of militia. 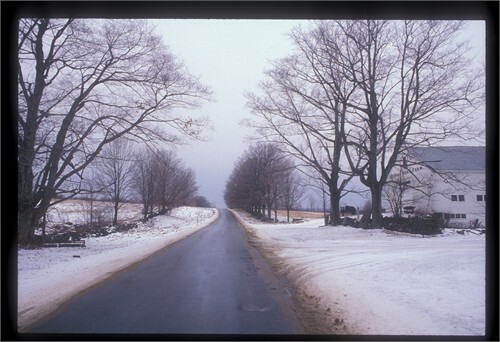 Although he held the rank of captain during his residence at Ipswich, he had had to accept the lower rank at Quaboag because of the small size of the military contingent. He was assisted in his duties by Second Sergeant William Prichard and Corporal Richard Coy. John Ayres, as commander of the local detachment of militia, and his subordinate non-commissioned officers Sgt. Prichard and Corp. Coy, were the ones to accompany Captain Wheeler and Captain Hutchinson in the mission of peace to the Indians on that fateful Aug 2, 1675. All three of these valiant men were to die with others of the military troops sent from Marlboro to treat with the Indians. Came to Quaboag before May of 1667. His full family of 7 sons and 1 daughter came with him. Died Aug 2, 1675 @ Wheeler’s Surprise. Came to Quaboag with his father in 1667. On Aug 28, 1672, he married 1. Abigail Hovey, daughter of Deacon Hovey, a neighbor at Quaboag. Abigail died young, probably at Quaboag, no children. He was at Quaboag during the Siege. Took his mother and remaining family back to Ipswich. 2. Married Mary Woodman of Ipswich, 3 children, no sons that survived. Death ??? Conflicting evidence, but it seems likely John, Jr. died Aug 12, 1711, age 62, at Boston. Came to Quaboag with his family. Returned to Ipswich after the Siege of Brookfield. Married on Apr 16, 1677, Abigail Fellows who bore him 10 children. Died at Ipswich on Feb 7, 1696-7. Some of the children of Samuel were prominent in the affairs of the 2nd settlement at Brookfield. Came to Quaboag with his family. Returned to Ipswich, never returned to Brookfield. Married in March of 1677-8 Hannah Herrington. They had 7 children. Came to Quaboag with his family. Returned to Ipswich. Married on Jun 9, 1684, Sarah Caldwell, who bore his 5 children. She died on Apr 29, 1710. He married Hannah Dutch at Ipswich, who came with him to Brookfield on Oct 23, 1713. He was one of those of the family to return to Brookfield for the 2nd settlement. Lived on his farm at Brookfield until his death. Did not attempt to resettle at Brookfield. Also an inhabitant of Kittery, ME. in 1690, with his brother Edward. In 1716, he is listed as of Portsmouth, N. H. He married and had 2 sons. Married Amy —– and had 5 children. Was a Blacksmith by trade and lived most of his life in Boston. Died in Boston on Dec. 4, 1737. Came to Quaboag with her family. After the siege returned with her family to Ipswich, at age 19 and single. This entry was posted in History, Veteran, Violent Death. Bookmark the permalink. 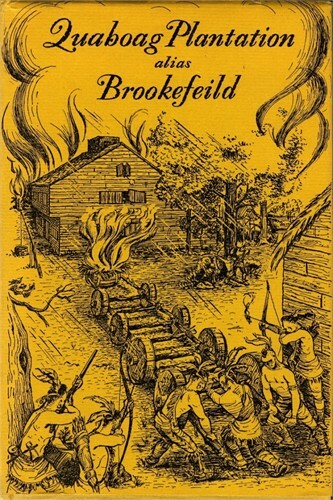 what book did you find the pictures of the siege of Brookfield? I found most of them on Wikipedia. One said Source: Sutro Library, San Francisco. Another said Collection of the Dover Public Library, Dover, New Hampshire. I try to use Wikipedia first for any pictures to avoid any copyright issues.